In the 18th century the newly formed United Kingdom of Great Britain was in the ascendancy growing rich from the growth of the American colonies and the slave trade. The Spanish empire, in contrast, was already in decline having bankrupted herself on religious wars in Europe which had largely depleted the wealth of her colonies in Latin America in the Wars of the Spanish Succession that took place in the first decade of the 18th century. The War had ended in the Treaty of Utrecht in 1713 which granted Britain the right to sell an unlimited number of slaves in the Spanish colonies and 500 tons of goods per year provided it came on one annual ship. This, however, did not stop Spain and Britain from fighting. Over the next 16 years they would fight each other in three wars, the last of these, the Anglo-Spanish War (1727-29) was a Spanish attempt to take Gibraltar back from British control. The Spanish failed but managed to gain a concession in the following Treaty of Seville (1729) that allowed them to search any British vessel in Spanish waters to check that Britain was not exceeding its previously agreed export quota to Spanish colonies in America. In 1731, off the coast of Florida, a British brig, the Rebecca, was boarded by a Spanish patrol boat, La Isabela. 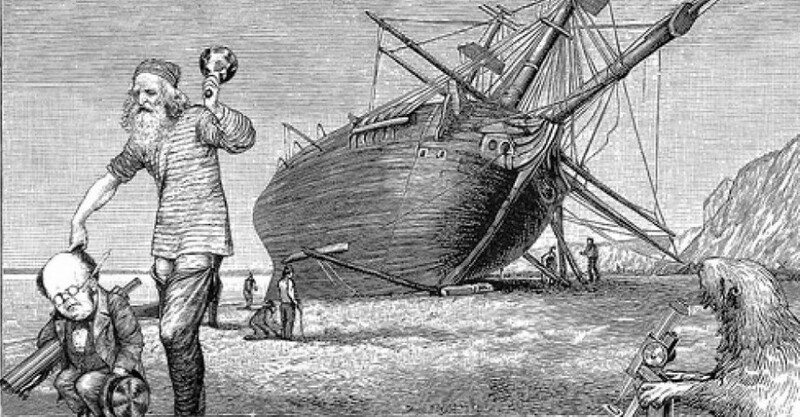 The British vessel was searched as was the right of the Spanish. Apparently the Spanish found a cache smuggled goods on board the ship in violation of the treaties between Britain and Spain. As an extreme punishment, the captain of the Spanish vessel, Julio León Fandiño, cut off the ear of the British captain, a Welshman called Robert Jenkins. Fandiño left the ship threatening to repeat the punishment on the British King if such a crime were committed again. The war that would follow would take its name from this incident, the War of Jenkin’s Ear. On return to Britain, Jenkins went through the laborious process of petitioning the British government for redress of grievances. 7 years later, in 1738, Jenkins was finally called before a House of Commons committee with his severed ear in a jar. The House was aghast by this and started baying for blood. War was declared on Spain on 23rd October 1739 (British military operations started the day before). The first year of the war involved a series of small and inconclusive naval battles. The first major battle would be the battle of Porto Bello in Panama. This silver exporting town was targeted in order to damage Spain’s finances. The battle was a victory for Britain and was hugely celebrated by the British people. Portobello road in London was named in honour of this victory and the song “Rule Britannia” was played in public for the first time. The battle would lead to a major change of Spanish trading practices. Until the capture of Porto Bello they had used a select number of ports from which large convoys would take goods to Spain. After Porto Bello they would send small trading ships to a wide variety of ports. The result was that Porto Bello’s economy was destroyed and would not recover until the construction of the Panama canal two hundred years later. The would rage across the Caribbean with the British navy largely being in control of the sea but, with the exception of Porto Bello, they were unable to win any footholds in Spanish territory. Three attempts were made by they British to capture the city of Cartagena, in modern day Colombia. This turned into an embarrassment for the British who had expected an easy victory after Porto Bello (apparently coins had been minted in Britain celebrating the anticipated victory). Cartagena proved much more resilient than expected. The British sent the largest fleet ever assembled, 186 ships (60 more than the Spanish Armada that was sent against Elizabeth I in 1588), 2620 pieces of artillery, and 27,000 men (4,000 of whom were led by Lawrence Washington the elder half-brother of the future first President of the United States). However, the Spanish were able to thwart the repeated attempts by the British to land. With supplies on the ships running low and the cramped condition on board causing an outbreak of yellow fever, the British were forced to call off the siege after just 2 months. The British had lost an estimated 6,000 men whilst the Spanish lost less than 1,000. It was one of the most humiliating defeats in the history of the Royal Navy. Following this huge defeat the war was scaled down somewhat due to British fears of French involvement. At the outbreak of the war the British and the Spanish had expected the French to enter on the side of Spain. After Cartagena there was fear in Britain that France and Spain would be able to invade the British Isles. As a result Britain became reluctant to devote any more ships or men to the war effort. The British did manage to take the Spanish colony of Georgia (now a state in the United States) and blockaded Florida. However, by this time war had broken out in Europe again. The Austrian War of Succession broke out between Austria and Prussia and consumed the entire continent. Faced with this new conflict the British and Spanish decided to scale down their own quarrels. The British fleet was brought back to Europe to fight in the new European theatre of war limiting conflicts in the Caribbean to minor privateering. The war was settled at the end of the War of Austrian Succession in 1748 at the treaty of Aix-la-Chapelle (Aachen). However, the war would not officially end until the Treaty of Madrid in 1750. Britain gained the colony of Georgia and expanded trading rights in Latin America but at the expense of the right to sell slaves there. The war had lasted for 10 years at the cost of thousands of lives for hardly any gain for either side, a war started by a merchant losing his ear. The war, oddly enough, led to greater cooperation between the British and Spanish governments as it became the policy of both nations to make friends of each other. The war introduced Rule Britannia and Portobello road to Britain and yet it is virtually forgotten in Britain and Spain. It is remembered with great pride in Colombia where the siege of Cartagena is there as the Armada is in Britain. The war is also commemorated in every year in Wormsloe plantation in Savannah, Georgia on the last Saturday in May. I was transfixed by this story in school, during a history less, when I was 13. its been lovely reading about it again, disasterous battles though they were. Our history teacher was very dull, the lessons dragged on a relentless monotone, but our history teacher (called Mr Jenkins) loved the story of Jenkins ear and that lesson he came to life, darting about and gesticulating as he told the story and he took us back to the 18th century. We were there. We felt Jenkins ear being sliced off, we furied at the Spanish villain who did it, we gaped at the ear in a bottle in parliament. I never forgot about Jenkin’s ear, but I’d forgotten the details, so reading this took me right back. Thank you! Interesting piece, but a few corrections would make it more accurate. There were 3642 Americans sent to the war under the flag of the 43rd regiment of foot. Their leader however, was Col. William Gooch (Lt Governor of Virginia). Lawrence Washington was one of four Captains under Gooch. Due to losses from disease, he was appointed Captain of the American Marines on Princess Caroline, Vernon’s flag ship. Later he would name his estate Mount Vernon in the Admiral’s honor. I rounded up the number of soldiers for simplicity’s sake. I am sure that you are right about Lawrence Washington; he was more of a side note so I didn’t do all that much research on him. What I like to do is link these stories up to events in history that are more commonly known hence I unintentionally may have exaggerated Lawrence’s role in the whole saga.